FREE - Lighted parking lot adjacent to the hotel. 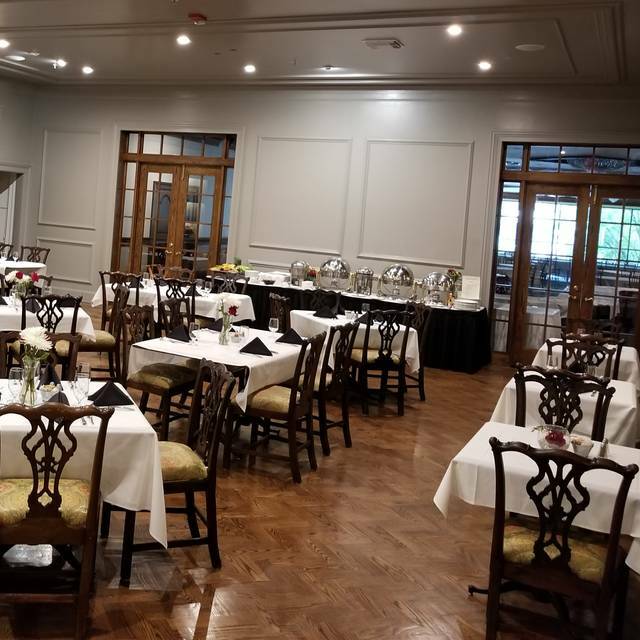 The Colonial Room / Club Room is an inviting, warm and intimate white tablecloth restaurant located just inside the Drake Oakbrook Hotel. Offering an extensive Chef driven menu including both classics, (Chateaubriand for Two) from the 1960's, popular contemporary dishes, (Citrus Crusted Chilean Sea Bass), casual fare, (flatbreads and burgers), and vegetarian/vegan offerings, (Portabella Burger). New to the Colonial Room is our Tapas menu served on Thursday and Friday nights. An extensive wine list, classic cocktails, and local craft beer round out the selections to create memorable dining experiences. Originally opened in 1962, stunningly restored in 2015 after being closed for 6 years, and recently updated in advance of our Autograph designation. 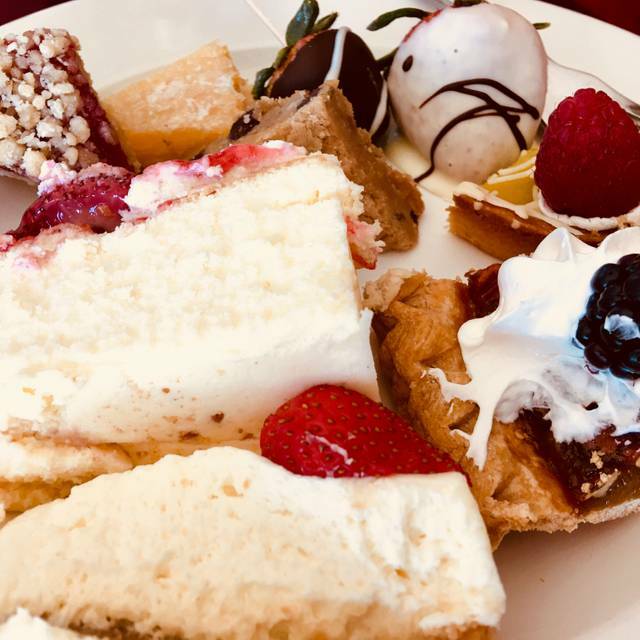 Our special Tapas menu, including a complimentary sampler plate as an appetizer, will be available on Thursdays and Fridays from 5-9pm in the Colonial Room starting Nov. 29, 2018. Experience the food, wines, (and sangria) of Spain with Mediterranean flavors that are sure to delight. Easter Sunday Brunch. The best. Service was superb. People we gracious and friendly. The food was just like mom would make. We are going to make this a habit after church. Service, Food, Atmosphere was superb! Ease of being seated was really appreciated. Flowing champagne and mimosas, never had to ask for a refill, staff was extremely attentive. Easter Sunday Brunch was as busy as one can get after Easter Sunday church service//mass. Drake handled the mass of people with professionalism and military discipline. Food is good and plenty to choose from. A little pricey but you get a lot. We last visited on a busy Sunday (Easter Sunday) and our experience was excellent. The waitstaff was attentive, helpful and pleasant. Although crowded, seating was arranged so that it didn’t seem so. Excellent food and outstanding service. I would highly recommend! The Easter brunch was outstanding. We arrived a few minutes before our reservation time, and were seated immediately. The service was impeccable. There were three servers that came to our table about every 10 minutes, to ask if we wanted more coffee, juice, champagne, etc. Water glasses were always kept full. Used plates were removed promptly. There were 2 rooms of food choices. Several breakfast entrees, a carving station, cold seafood bar, hot side dishes, and a huge selection of desserts. Everyone from the hostess to the servers were very polite and accommodating. I will definitely be back for future brunches. Great girls night out for their Tapas and Sangria Night- on Thursday and Fridays . "I enjoyed the relaxed feel of this place – the room was beautiful, elegant and comfortable. I definitely would return to try more dishes. We had the chopped chicken salad with Cajun vinaigrette dressing. The lettuce was cold, crisp with no wilted pieces. The service was friendly but not over - bearing. Our served David was amazing! And the rest of the staff all provided us with great conversation and recommendations. Definitely coming back soon. The atmosphere was nice and service grand but breads dried out and would prefer plain scones and it seemed like the clotted cream failed to clot. When we had lunch, it was OK. The High tea was a disappointment. We would go back for lunch, but not for the High Tea. We had a very nice experience at the Drake Oakbrook's Colonial Room. We went on an early Thursday evening. For most of our dinner we were the only diners in the Room, probably because we were early (6 pm) for a hotel crowd. The food was good and the service was excellent. The room decor is very nice. Place was nice and clean. Waffles French toast and eggs Benedict were sitting dried out too long no crops bacon they had to make some it was all limp and no variety of doneness . Selection was good salads were very good. Coffe was cold once cream was added. No sweet rolls or pastry just deserts that were ah ok. First time at this location felt chicago location was better and more worth the price. They also have a down hill parkin and and walk in which the side walk was salted about 15 feet so you had to walk down hill on ice for at least 100 feet sliding with nothing to hold in to to get to parking. Portions are smaller for the cost but the service is excellant. David and Francisco are awesome staff. They are very attentive and friendly. We have eaten here in the past. Food is very good to outstanding except portions but the chef gets the preparation and flavors spot on. They had live music (jazz)at the bar and it was standing room only. Older crowd, lots of dancing, people having a great time. We went to the lounge after dinner and stayed until the band finished. Great date place! Valentines Day evening was wonderful! The food was excellent as was the service. We got married at the Drake Hotel 10 years ago and we love coming back every year! Fantastic, attentive staff! The space was crowded and the hotel was closing up the tea service space all around us at the end of our tea (a bit distracting) but a nice time. Would return for the staff and tea! I was here a year ago and it was wonderful with excellent service. Unfortunately, this time was just the opposite. The food was sparse with no refills, the service was terrible and rushed. They also did not have my open table reservation . Luckily I called to check my reservations in advance. I hate to give a bad review but I would also hate to see anyone else have a bad experience. So sad, it would be nice to have a lovely tea room so close at hand. They also need to train their waiters on how to serve and elegant High Tea. We enjoyed the lunch and we are going to try the tea. The service was very good. The only thing that was wrong was that they were doing all kinds of remodeling and The Colonial Room was a lot smaller then I thought it would be. I do not know if this is the normal room or if they were using this during the remodeling. There aren't many restaurants where you can have a really nice quiet dinner. This newly remodeled Colonial Room is absolutely beautiful. The food is amazing. Everytime I have dinner here I have to have the Sea Bass. The best I have had anywhere. The staff is outstanding especially David who is exceptional. We have been staying at the Drake whenever we see a play at Drury Lane but we love the Colonial Room so much that we come here for dinner whenever we want a nice dinner. Its nice to have dinner in a place that doesn't have TVs and you can enjoy the food and ambiance. They also have Tapas night and Margarita Weds and Singers in the Polo Lounge on Sat Nite. It was very nice and the mimosas were great. It’s a little high priced for a buffet but the food was good and there was something for everyone. We would still go again. It’s just somewhere you can’t go often because of the price. The service was fantastic, everything I expected from an establishment of this kind. The food was standard but plentiful. None-the-less, our event was enjoyable because of the service. Thank you for your outstanding work! Beautiful appointments in location, furniture and presentation. The Brunch Choices are well above average and presented in a 5 star manor. Both the food and service are well above average. Every need is met, everyone is cordial and wants you to have the best experience possible. There is an Omelet, Waffle and carved meat station in addition to a myriad of prepared choices such as Eggs Benedict. Wonderful pastries, fresh fruit and cheese options as well. Come hungry and stay a while. You are never rushed and all non alcoholic drinks are included. I took my sister here for High Tea and it was awesome! We had a great waiter named David who took great care of us. Everything about the the place was great. They called the night before to confirm my reservation and since I had posted that it was a birthday celebration, they asked for the name of who's birthday it was. A beautifully decorated plate with her name and a generous piece of cake was delivered to the table with two lit candles in it. There were several other tables during our visit with other parties doing high tea. Loved the room and the quiet music playing. Talking socially was not an issue as it was not loud or hard to hear in this room. We will definitely do another visit here! It's a little gem. Appreciated being able to choose options off both tapas and regular menu. Good food and good service. Only minor complaint is that they brought so many dishes all at once, which was overwhelming. I went to the Drake Oak Brook for the Santa breakfast. The reservation was for the Colonial Room, but we ended up sitting in some “ballroom” which was near windowless. The wait staff was horrible and inattentive, I waited nearly a half hour for a cup of coffee. The check in was confusing, you had to take some random unmarked path through the bar, where they had no problem charging you up front with a healthy gratuity. The crafts for the kids were no where near Santa or the eating area, for that, you had to leave the entire area and go to a whole different part of the hotel in the basement. Not a good experience and I certainly expected more from the Drake. The Santa breakfast was wonderful. A beautiful room and friendly well-trained staff. Food was excellent. Certainly kid friendly. The only suggestion might be to have a few elves or other Christmas characters in the dining room. Marshall Fields used to have a few Christmas fairies sprinkle fairy dust during walnut room Christmas lunches. The kids loved it. We were seated in a banquet room, rather than the main dining room. Unfortunately this was lacking in ambiance and took away from the overall experience. There was no one seated in the main room, and I was told they were only seating there on Saturday. It was disappointing that we were not told of this change beforehand. Had I known, I would not have booked the tea on a Friday. The service was great at least, but the food left something to be desired. I understand that these items are made ahead of time, but the sandwich bread was pretty dried out. Wonderful food and service. Definitely a hidden gem and we will be returning. I have never been to a high Tea that serves everything at one time. Also never been to a high Tea that even thoug you have 3 people at your table you only serve 2 of the same kind of sandwiches. They always serve everyone one of each item on the plate. Then if you need more sandwiches they usually as which one do you want. I never had them bring another plate again of 2 each when serving 3 people. I have been to about 7 High Teas This one need much improvement. I will not be going back. They should look at the High Tea downtown at the Drake what a difference. Great service, quite with very good food at a reasonable price. We went out to dinner to celebrate a birthday. We couldnt have asked for a better server. David was very polite and has great knowledge of the tapas being served. He made our experience one of a kind. He asked for all of our names, which made the whole night more personable. The food was very excellent. The ingredients were very fresh and presentation was beautiful. The dessert was out of this world. We tried a couple of desserts and then they brought us chef’s choice of a dessert. Raspberry cheesecake. So good! 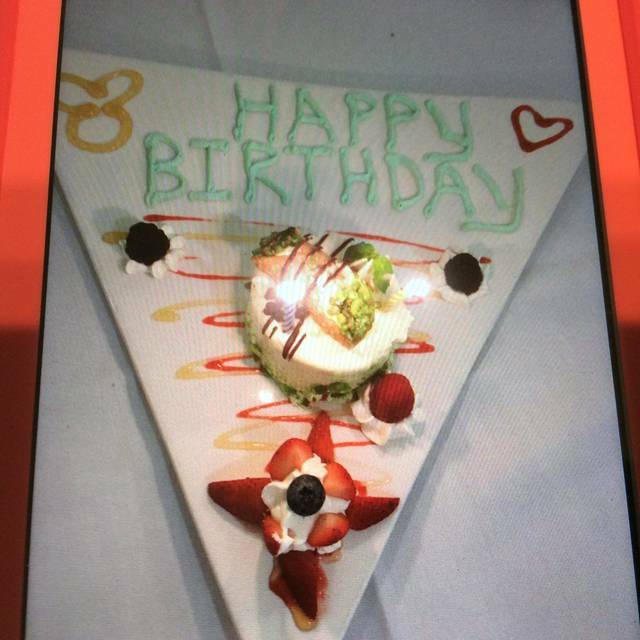 And they even personallized the dessert by writing the name of the birthday girl! Even the chef, Ezequiel, personally came out to see if we enoyed all the food that was served. The evening was perfect, we even sat by rhe fireplace and took pictures by their christmas tree! Thank you again! Nice holiday buffet. Great service! Nice selection of items for all ages. Decor was beautiful! Costing 380.00 for 4 people the food was not good at all. I usually do the Thanksgiving brunch at Ditkas Arlington Heights which is Amazing! I thought the Drake would have been just as good but I was wrong. The food is top-notch and the ambience is elegant and inviting. 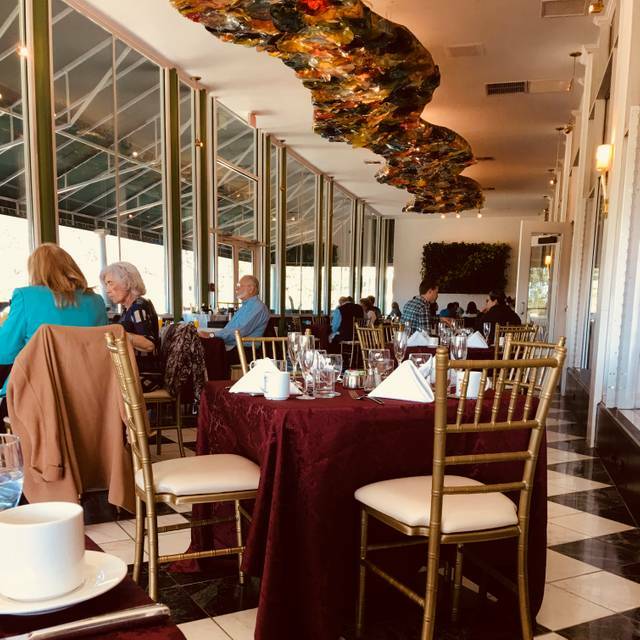 My husband and I went for Thanksgiving and it was our first time dining at The Colonial Room. While the per person charge is somewhat steep, the choices were plentiful from meats, sides, salads, seafood and desserts. Most important, everything was so delicious that we had to be careful not to overeat! The service and ambiance were excellent. Holiday music was playing in the background but it was not distracting. The room itself is open with windows all around. Had it been snowing, it would have been a beautiful sight. We thoroughly enjoyed the experience! We went to the Colonial Room for Thanksgiving lunch. The food was pretty good (for a buffet), the service was exceptional, but the dining space is tired. For the money, other places feel a lot more special. Made reservations for 45th anniversary dinner through open table. Showed up restaurant was closed. I will never go here again. I will never use open table either.